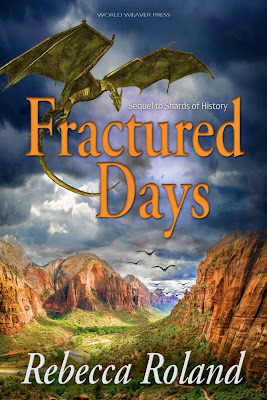 My fellow WWP author, Rebecca Roland is releasing the sequel to her fantastically atmospheric fantasy novel Shards of History, and today she's revealing the Cover Art! Check it out below, along with the blurb! And if you haven't read Shards of History, and love fantasy, definitely grab your copy and give it a read, so you're ready for FRACTURED DAYS, available June 9th! And it looks like there's a Goodreads Giveaway, too!